Have you figured out your bridal party yet and have you asked them? If you want to do something a little more than just asking them, the not-so-new trend is giving each lady (or man) a “Will you be my…” Box. 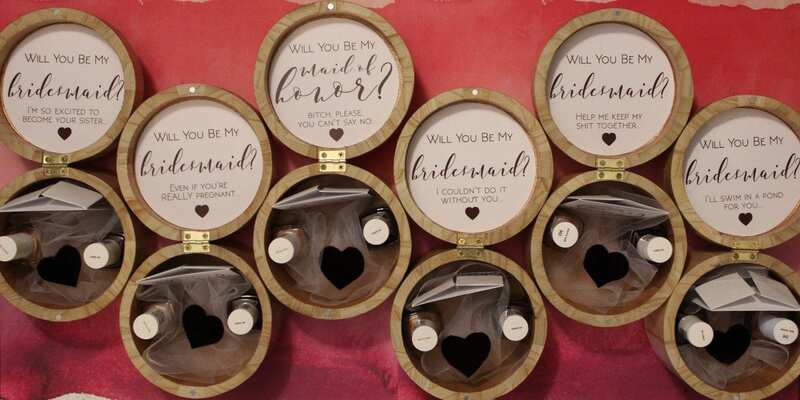 These boxes are usually catered to the theme of your wedding and are very DIY. Most boxes include gifts of either champagne or ring pops and they will have cutesy poems or cards with them. After looking at a fair share of them on Pinterest, I decided to do something small and simple. 1. Smooth rough edges with sand paper. Don’t go too crazy with this because the wood “hairs” are only going to pop right back out once they get wet from the Modge Podge and/or paint. 2. Start painting the interior. Don’t be afraid to lather on the paint either. These boxes will absorb some of it. I ended up doing two coats. At the same time, if you bought any wooden letters or fun shapes to put on top, paint these with the color you prefer. 3. Seal the interior with a nice thick layer of Modge Podge. Don’t be alarmed when you use this. It will look white but it dries clear. At this time I also painted the interior rim. If you decide to do that- do NOT close the box. Modge Podge is also a glue and it will glue it shut! 4. While its drying, I cut out my signs for the interior. I used an exacto blade to do this. You can also use scissors OR if you’re really crafty and have an electronic cutter (silhouette or cricut) use that. My work space was pretty full at this time so I cut mine by hand. I designed the signs previously on Adobe Illustrator. If you prefer to use Photoshop- go ahead. If you don’t have access to either, Microsoft Word works perfectly fine. 5. If you want to paint the exterior an alternate color, now is the time. I personally wanted to keep the wood color, so I just started to add the Modge Podge to the exterior. Again, slather it on. I did two coats but don’t forget to sand the rough edges in between coats. HOWEVER, make sure the paint or Modge Podge is dry first or you will ruin your sand paper. 6. While the exterior is drying, work on what you want to put in the interior. I used tulle ribbon to “stuff” the boxes and hold the items in place. For the round boxes I cut the tulle in 40″ pieces. For the square- I did 60″. I also used this time to fold up the “important information” paper (again, I did these on Illustrator) and cut the heart swatches. You do not have to do this. Feel free to do what you want and get creative. They are your boxes to give! 7. If you bought wooden letters or shapes to add to the box, you can add them now! I used a craft glue called Tacky Glue but you can also use Modge Podge or another strong adhesive. I would stay away from using hot glue only because in my experience a majority of items I have hot glued together, fallen apart. 8. Now that you’ve spent some time watching paint and glue dry, it’s time to add the gifts and interior decor. To attach the interior message, I used double sided craft tape and pressed it onto the top side of the lid firmly. I didn’t want this message to be permanent incase my girls wanted to reuse the box for something else. Next I stuffed the bottom with the tulle and arranged my little gifts, swatches, and information sheet. Voila, bridal party gift boxes! As I mentioned previously, I kept my boxes small. Not because I didn’t want to give them more but mostly because I will be spoiling them later with thank you gifts.